Nurses take pride in providing the highest quality care for their patients – that’s why they became a nurse. However, nurses know that their ability to provide quality, safe care is jeopardized when they are fatigued and overworked due to inadequate nurse staffing levels. Mandating RNs to work beyond their regularly scheduled hours is commonly used to staff health care facilities on a regular basis. Fatigue can affect nurses’ ability to deliver optimal patient care. Research demonstrates that fatigue causes an increased risk in errors, decline in memory, reduced ability to learn, and impaired mood and communication skills. Further, scientific evidence links long working hours to many health effects, including cardiovascular disease and cancer. Patients, nurses and hospitals all benefit when nurses are at their best. The needs and safety of the patients and nurses need to be put first instead of trying to cut costs. When our overriding objective with staffing is to ensure quality care, patient safety and satisfaction, then patients benefit. When staffing takes into consideration the number of patients, patient needs, the experience and expertise of nurses to ensure patient safety and care at the highest level, nurses benefit. And when staffing plans are designed and deployed to mitigate nurse fatigue, afford the highest-quality care from nurses and reduce the number of preventable readmissions, hospitals benefit. Staffing plans that rely on mandatory overtime to fill gaps are unsafe and unacceptable. Nurses are being mandated to put their lives and licenses on the line every day in facilities throughout the state, and it will only change when nurses come together and demand change. That’s why we need you to take action now. House Bill 144 will make Ohio the 19th state to prohibit forced nurse overtime. March 19, 2019 – New General Assembly, New Bill – House Bill 144, sponsored by Representative Don Manning (R-New Middletown) and introduced on March 19, 2019, aims to make Ohio the 19th state to outlaw nurse mandatory overtime – a potentially dangerous practice occurring across Ohio that can jeopardize safe patient care. Read the press release here. December 20, 2018 – OSUNO nurses deliver over a thousand letters to OSU admins demanding the medical center reverse its opposition of House Bill 456. Watch media coverage here. December 12, 2018 – House Bill 456 blocked at the statehouse. Read the statement here. January 31, 2018 – HB 456 received sponsor testimony from Representative Sprague. January 17, 2018 – Read the latest bill backgrounder. January 17, 2018 – House Bill 456 referred to House Health Committee. December 29, 2017 – House Bill 456, legislation to prohibit nurse mandatory overtime, was introduced into the Ohio House of Representatives by sponsor Representative Robert Sprague on December 29, 2017. ONA members are taking the lead to find the right nurse staffing solutions for Ohio. Join us! Patients deserve safe, quality care, and nurses deserve a safe working environment. ONA has a long-standing presence at the Statehouse and knows better than any other registered-nurse organization how to influence legislation in Ohio that protects and advances the nursing professional and promotes quality care for the citizens of Ohio. ONA advocates will be empowered to take action on staffing and other nursing issues with the support of ONA’s staff. It only takes a few minutes, and any nurse can be an ONA advocate. Sign up today! Invite your friends and family to support you by becoming an ONA Advocate. Share this post on Facebook to help us get the word out! We need to activate not only nurses, but the patients we serve in order to transform nurse staffing in Ohio. Social media is one of the most effective ways to spread the word and gather support! Nurses should have the ability to say no when they’re too fatigued to provide the safe care patients deserve. Sign the petition to show lawmakers that Ohio must become the 19th state to eliminate nurse mandatory overtime. Are you being forced to work past your scheduled hours to fill staffing gaps? Are you are working longer hours with less help? Are you fatigued because of increased workloads? 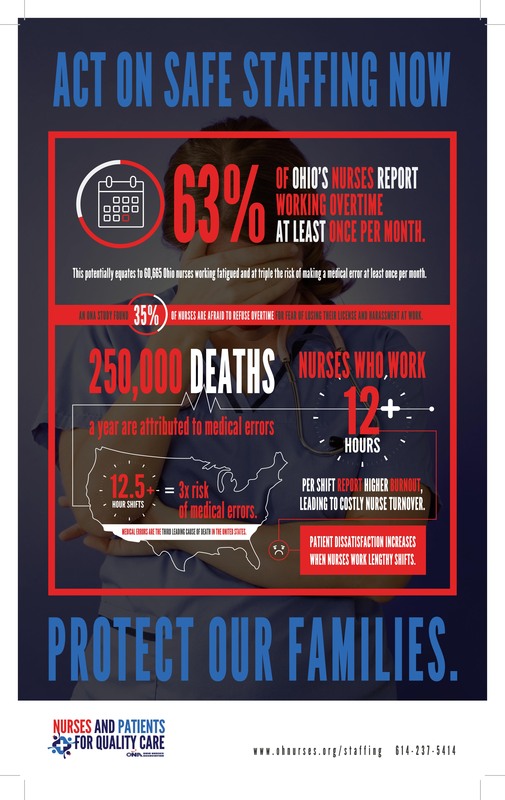 Every nurse has been put in a compromising or unsafe position due to unsafe staffing, and in order to effect change, legislators and the public need to hear your story! Please take a moment to share your story. If you don’t feel comfortable sharing your contact information, that’s okay – your story is still important to helping transform nurse staffing so that nothing is standing in the way of your ability to provide the quality care that Ohio’s citizens deserve! Can we use your story in our campaign to highlight the need for change in staffing practices in Ohio? Yes, but not my name. Yes, and you can share my name. No, this is for your internal research only. Would you be interested in testifying before the Ohio General Assembly? Nurse staffing is complex. We built the foundation for safe staffing in Ohio and will continue to build on that platform until Ohio becomes a state that prioritizes quality patient care and safe nurse staffing. 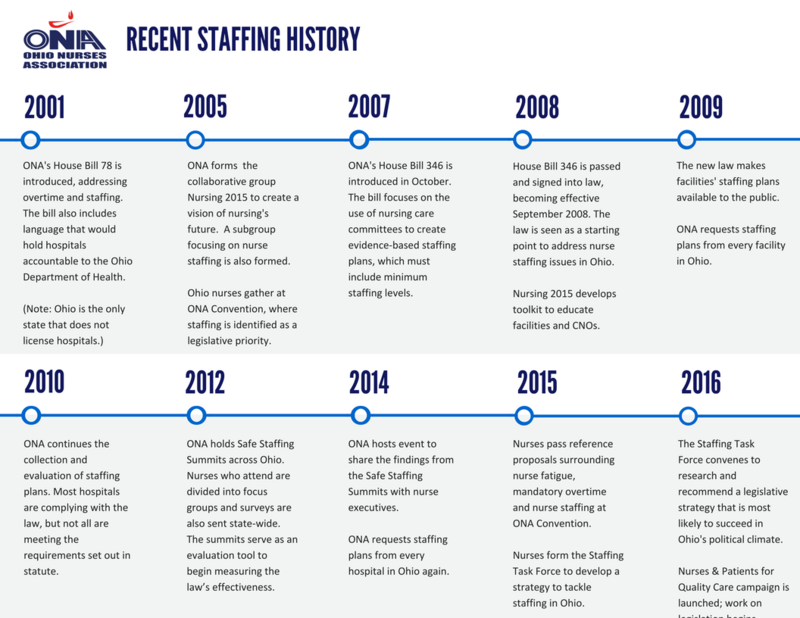 ONA has been advocating for staffing improvements for decades, ultimately passing the first version of legislation in 2008, which legally requires hospitals to form nurse staffing committees that are tasked with creating a facility-wide plan. You can read more about the history of ONA and staffing in the infographic below. Since that time, the health care landscape has changed dramatically, including an aging patient population and more patients entering the system. In 2015, Ohio nurses conveyed their ongoing concern through a statewide survey on staffing, and ONA members set staffing as a priority at the 2015 convention. In 2017, ONA helped pass budget language that requires hospitals to submit their nurse staffing plans to the Ohio Department of Health to increase transparency to the public. In 2018, ONA worked with Representative Sprague to introduce House Bill 456. This legislation will make Ohio the 19th state to prohibit nurse mandatory overtime. Join the Ohio Nurses Association. ONA is a member-driven organization and your dues, your time and your voice support initiatives just like safe staffing. Join our powerful network of registered nurses today! Join our mailing list to receive the latest staffing news and find out about opportunities to get involved and help us transform nurse staffing in Ohio. You're in! We'll let you know via email about how you can get involved!